Thank you very much for your recent letters. We were quite interested in your account of the Pauling Seminar. The day following the arrival of your letter, I received a note from Pauling, mentioning that their model had been revised, and indicating interest in our model. We shall thus have to write him in the near future as to what we are doing. Until now we preferred not to write him since we did not want to commit ourselves until we were completely sure that all of the Van der Waals contacts were correct and that all aspects of our structure were stereochemically feasible. I believe now that we have made sure that our structure can be built and today we are laboriously calculating out exact atomic coordinates. Our model (a joint project of Francis Crick and myself) bears no relationship to either the original or the revised Pauling-Corey-Schomaker models. It is a strange model and embodies several unusual features. However since DNA is an unusual substance, we are not hesitant in being bold. The main features of the model are (1) The basic structure is helical - it consists of two intertwining helices - the core of the helix is occupied by the purine and pyrimidine bases - the phosphates groups are on the outside. (2) The helices are not identical but complementary so that if one helix contains a purine base, the other helix contains a pyrimidine - this feature is a result of our attempt to make the residues equivalent and at the same time put the purines and pyrimidine bases in the center. The pairing of the purine with pyramidines is very exact and dictated by their desire to form hydrogen bonds - Adenine will pair with Thymine while Guanine will always pair with Cytosine. For example [diagrams of base pairing] Thymine with Adenine, Cytosine with Guanine. While my diagram is crude, in fact these pairs form 2 very nice hydrogen bonds in which all of the angles are exactly right. This pairing is based on the effective existence of only one out of the two possible tautomeric forms - in all cases we prefer the keto form over the enol[,] the amino over the imino. This is definitely an assumption but Jerry Donohue and Bill Cochran tell us that for all organic molecules so far examined, the keto and amino forms are present in preference to the enol and imino possibilities. The model has been derived almost entirely from stereochemical considerations with the only x-ray consideration being the spacing between the pair of bases 3.4A which was originally found by Astbury. It tends to build itself with approximately 10 residues per tern in 34A. The screw is right handed. The x-ray pattern approximately agreed with the model, but since the photographs available to us are poor and meagre (we have no prototypes of our own and like Pauling must use Astbury's photographs) this agreement in no way constitutes a proof of our model. We are certainly a long way from proving its correctness. To do this we must obtain collaboration from the group at Kings College London who possess very excellent photographs of a crystalline phase in addition to rather good photographs of a paracrystalline phase. Our model has been made in reference to the paracrystalline form, and as yet we have no clear idea as to how these helices pack together to form the crystalline phase. In the next day or so Crick and I shall send a note to Nature proposing our structure as a possible model, at the same time emphasizing its provisional nature and the lack of proof in its favor. Even if wrong I believe it to be interesting since it promises a concrete example of a structure composed of complementary chains. If by chance, it is right then I suspect we may be making a slight dent into the manner in which DNA can reproduce itself. For these reasons (in addition to many others) I prefer this type of model over Pauling's which if true would tell us next to nothing about [the] manner of DNA reproduction. I shall write you in a day or so about the recombination paper. Yesterday I received a very interesting note from Bill Hayes. I believe he is sending you a copy. I have met Alfred Tissieus recently. He seems very nice. He speaks fondly of Pasadena and I suspect has not yet become accustomed to being a Fellow of Kings. P.S. We would prefer your not mentioning this letter to Pauling. When our letter to Nature is completed we shall send him a copy. We should like to send him coordinates. Professor A. R. Todd, F.R.S. I am glad to have your letter of 4 March, and the samples of deoxyribonucleotides. We are starting their investigation immediately. I shall also look forward to having the fourth member of the group, deoxycytidine-3' phosphate. I have no new results to communicate to you at the present tine. I have, in fact, been working recently on a new theory of ferromagnetism. Letter from LP to Dr. William Simpson of the Dept of Chem. at U. of Washington RE: encloses a manuscript of a paper that he wrote 14 yrs. ago regarding the problem of the color of dyes. Relates it to one of Dr. Simpson's paper's that he saw in the last issue of the Journal of the American Chemical Society [Filed under LP Correspondence: Box #379, Folder #1]. Letter from LP to Mr. Proskauer RE: comments on the proof sheets of the book on physical chemistry. Goes on to answer Mr. Proskauer's questions about the possible applications of the book and what he thought of it. Returns the proof sheets. 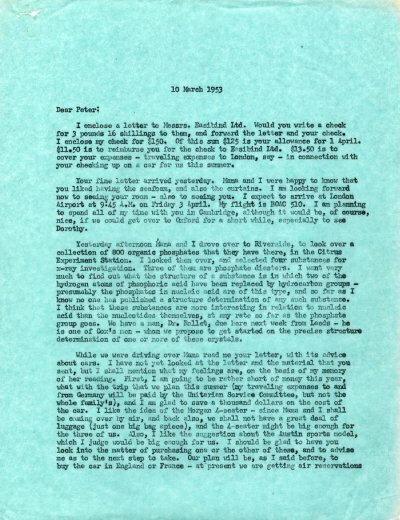 [related letter from Maurits Dekker to LP March 5, 1953 (Filed under P: 1953)] [Letter of response from Mr. Proskauer to LP March 30, 1953] [Filed under LP Correspondence: Box #313, Folder #1].